1. First put on a cotton bonnet cap, so that it just covers the auricle, leaving a space for the stethoscope to be placed in the ear. 2. You will need an opaque shayla, but make sure it's not too wide. Make one end shorter than the other and place on your head, the shorter end being on your right hand side. Secure at the back of the neck using a safety pin. Again, make sure that only the top of the ear is covered. Make it as tight and secure as you can. 4. At this point, you should have the long end of the shayla hanging on your left hand side. Take this and wrap around the front, and over the head, as far as it will go, and pin at the top with a straight pin. 5. Make sure the shayla is loose at the front, to allow you to get the stethoscope in comfortably from underneath. This style is also great for summer, because your neck is covered, but you don't have any annoying safety pins and only one layer of fabric. Inevitably, if you're in clinics all day, your hijab will get a little messy, but it should be minimised if the shayla is wrapped tightly enough at the beginning. Any other medics out there want to share their tips? Such a cute article, I love it! Although I'm not a doctor I think it's so sweet. Mind if I link to it in the future? very good idea! if only i could find tips and ideas for my airline uniform... i work at an airport, and just wear a normal hijab, though i wish i could wrap it another way. I loveeee your blog sister. I'm a Muslimah who is trying to become more religious. Although I do not wear hijaabs or abayas, etc...I want to one day and it is nice to see that hijabi's do not have to compromise on fashion to do so. I love your website. I am new muslim (of 3 months) who needs tips on clothes big style. I am also a surgeon. I dont wear hijab as yet but inshallah I will do someday soon. Do you have tips on hijabs for surgeons? we have to wear surgical hats which makes hijabs difficult to wear. Unfortunately it is very difficult to cover your arms fully as you are scrubbing up so many times that if you sleeves were to fall down you will have rescrub! i settle for 3/4 sleeves. It also gets REALLY hot with the surgical gowns on! Any tips for new muslims and in the medical profession are incredibly welcome. Thanx for posting this, I've tried out the style and it seems to do the trick. Salams - great topic! I am a nurse... I tried the style you describe - for me it was cute when I put it on, but slipped ridiculously by the end of the day, and i was constantly adjusting and fiddling with it... Drove me crazy. Now I wear the amira at work, as do other nurses I know. It's soft, stretchy, needs NO adjusting or readjusting, and it leaves easy access to the ears. I also think it looks more professional in this context (ie I don't look like I'm dressed for a party). Also it's more hygienic - no long drapey bits of fabric or fringes touching my patient or leaning into any contaminated areas. I think the key to making it work is to get good quality scarves, two piece, with no beads or trim. And not too tight! This way you avoid common pitfalls of the scarf looking either 1) cheap and tacky or 2) with the dreaded shrink-wrap "ninja-head" look..
salaam you can buy lots of beautiful bonnet caps atwww.hijabnow.com for really good prices too! Salam! I'm so glad you posted this article. I'm a med student starting my rotations in a few weeks, and I've been hopelessly trying to figure out how to manage the hijab and stethoscope practically with our hot and humid weather here in Singapore. I normally wear the square scarves with 3 bobby pins ('Malaysian style') but found that I'd have to remove the pin underneath my chin everytime I wanted to auscultate. I found that impractical and also not very clean in the septic sense. I then tried the Amirah scarves with some success, but it left me feeling really hot and icky by midday. With frequent use, I ended up making tears as I try to squeeze the earpieces through, so making the 'hole' for the face bigger. Next I tried using long scarves (actually my square scarf folded in half) and just tying it at the back and twisting whatever loose ends remain into a sort of ponytail. This works wonderfully with the stethoscope, but it leaves the neck area exposed. I try to minimize that by wearing shirts with mandarin collars, or by wearing a tank top with a high neckline underneath my shirt, but I'm still not really 'at peace' with this solution. So I only wear it on days that I absolutely have to. Nobody else in my school wears the hijab and I am beyond giddy with excitement to find your article here. I will definitely try out your suggestion and the lovely tips everyone gave, and keep you posted. Thank you so much for this timely piece. Sayma, I've posted so many styles here, just click on the 'how to wear hijab' label. Tabassum, thank you very much :) I'm glad you're finding it useful! Julaybeeba, let us know if you like it! Vicki, Masha'Allah! As for the hijab, if the hat is ging to go over it, then the easiest thing to do is probably to wear a turban-style, with a roll-neck top for neck coverage. I know it gets crazy hot though! As for sleeves, unless you can get a top that has an elasticated cuff, I don't think there's much to be done. In the interests of patient safety, the 3/4 will have to do I think. Milk and Umsami, thing is I really, really, dislike Al-amirahs on their own. I only ever wear them to the gym! Sarina, you're welcome! Let me know if it works! first of I love your blog and the only reason I created my account was because of your blog! mashalla its brilliant words cannot describe how much I appreciate it. My best tip is to wear a cotton bonnet cap. I prefer the slip-on ones, rather than the type you tie. I am a critical care nurse of 2 1/2 years and I've found the easiest hijab to wear and the most comfortable is a one piece amira. As for sleeves, I always wear a cotton long sleeve under my scrubs, then I can pull them up if I'm getting into something messy--which is more than any of you would probably like to hear. Thanks for the great blog. i'm so excited to have found this site :) i converted nearly three years ago and am currently studying to be a doctor. 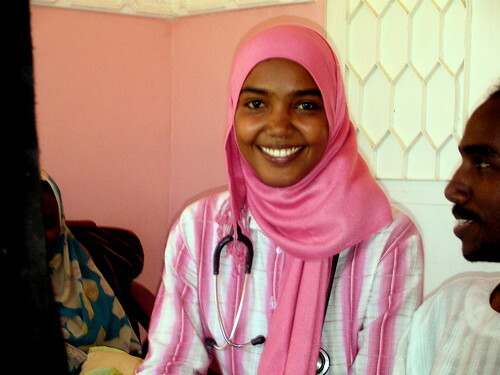 the one thing i've always worried about is how i'm going to deal with having to use the stethoscope constantly while wearing hijab. i've been sticking with the amiras up until now, but this site has been so helpful and now i have more than one option. thank you so much! jazakallah khair! Jana I love this site! Ive become addicated!! Im a F2 dr at the moment. I use an orthopaedic hood in theatre. They are fantastic - it is opaque and covers all my hair plus my neck. Only down side I look like like a orthopod! Re. the sleeves it is has become so much harder since all the infection control protocols came in. I am a Dr wearing hijab for the last 10 + years and working - I have found that a two piece hat and pull on burka type thing to be the best option - it is readjustable through the day and what i do is wear a headband in an alternate mathing colour underneath which keeps my hair out of the way - works like a bomb, and I often will wear it inside of a shirt with a nice stiff collar - which also looks very smart and professional. I think if you have it made with good quality stretchy fabric, it makes the world of difference!! i have tried to do this style SOOOO many times and i am completely confused by it. what is going on with that spanish wrap?! i can't figure out what to do after step 3. Salam...Im a medical student at Lancaster and have tried it all...for me the Al-amira works best...even if it does look awful! aysh- i agree about the sleeves, there are all these new guidelines about baring below the elbows...not really any way around it..